In the U.S., it is recommended that men between the ages of 51 and 70 get about 1,000 milligrams (mg) of calcium from their diets on a daily basis. For women in the same age group, and for both males and females over the age of 71, the daily recommended calcium intake rises to 1,200 mg. But according to two new studies published in The BMJ, the bone health of older adults does not improve with increased calcium intake. The average daily calcium intake for older adults in Western countries is about 700–900 mg, with many seniors taking calcium supplements to meet dietary recommendations. 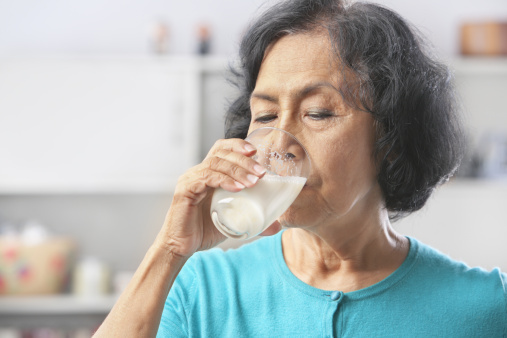 Mark J. Bolland, study author and associate professor at the University of Auckland in New Zealand, suggests that calcium intake guidelines for older adults needs to be reconsidered. For both studies, researchers analyzed observational studies and randomized controlled trials that looked at how an increased intake of calcium (through diet and supplements) affected bone density and fracture risk among men and women aged 50 and older. In the study that assessed bone density and calcium intake, researchers looked at 59 eligible randomized controlled trials. They found that men and women who increased their calcium intake using dietary supplements only experienced a one to two percent increase in bone mineral density. The team concluded that this is unlikely to lead to a significant reduction in risk of bone fracture. The second study consisted of 44 cohort studies and two randomized controlled trials. They assessed the association between increased calcium intake from dietary sources such as milk, supplements, and dairy. Bolland, M.J., et al., “Calcium intake and bone mineral density: systematic review and meta-analysis,” The BMJ September 29, 2015, doi: 10.1136/bmj.h4183. Whiteman, H., “Increasing calcium intake ‘does not improve bone health of seniors’,” Medical News Today web site, September 30, 2015; http://www.medicalnewstoday.com/articles/300219.php.